Maryland is the home of Blue Crab. If you were to survey Baltimoreans on where and how to eat a crab, the answers would vary. Sitting down at a paper covered table with a heaping pile of steaming Old Bay covered crustaceans is an experience second to none and one that is unique to our beloved Baltimore. We recently conducted Baltimore research on where and how Baltimore residents eat their steamed crabs. Continue reading to see the findings. Baltimore research and steamed crabs. A perfect combination. Of the 1,164 participants surveyed, 50% prefer to dine in, while 50% would rather carry their crabs out. Of those respondents who dine in, 22% want to pick their crabs in an establishment with a view (e.g. view of the water). When asked “from where do you order crabs?” Baltimore residents reported ordering their crabs from Canton Dockside (8%), Bo Brooks (8%), and Costa’s Inn (7%). Other Baltimore restaurants chosen include Nick’s Fish House, Crackpot, and Al’s Seafood, to name a few. A list of establishments known for selling steamed crabs in the Baltimore area was provided. When ordering crabs, 14% of those surveyed reported they prefer eating female crabs, 62% prefer eating male crabs, and 24% have no preference. Once the crabs are on the table, 40% of those surveyed report starting by eating the claws, 51% report saving the claws for last, and 9% either do not eat them at all or save them to use later for other recipes such as a Maryland Crab Soup. When eating crabs, 59% surveyed report wanting no condiment in which to dip the crab meat they pick. Butter is the condiment used most frequently by 23% of those surveyed, followed by Old bay (13%), and Vinegar (6%). Other items listed by 9% of those surveyed include lemon, ketchup, mustard, and homemade “secret” sauces. Marylanders have been known to eat parts of the crab that some may consider inedible. The mustard, a greenish yellow gland also called the tomalley, is eaten by 47% of the Baltimore residents surveyed. Nothing besides the “white meat or mustard” is eaten by 90% of those surveyed, while 10% report eating other parts of the Crab. Other parts listed include the white intestines, female eggs (roe) and the dead-man (gills/lungs). Disagreeing on the best place to eat crabs or the one right way to eat them is a topic Marylanders love to debate. 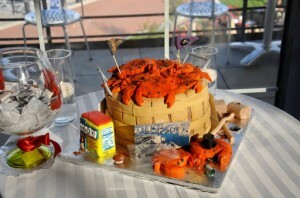 The debate will continue, gathered around paper covered crab tables, while sharing this beloved Maryland tradition. This entry was posted on Wednesday, June 3rd, 2015 at 5:28 pm. Both comments and pings are currently closed.